Here you find the most commonly asked questions about stick insects. How old can a stick insect become? 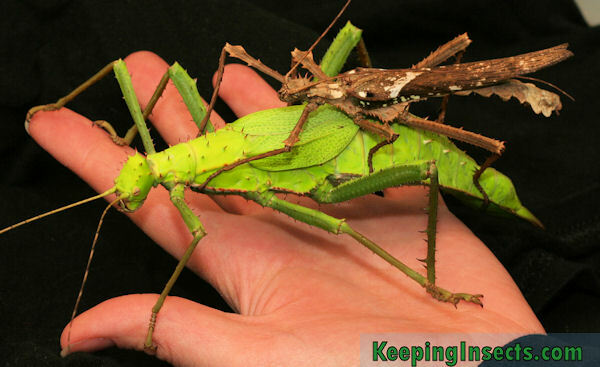 Generally speaking stick insects live for 4 to 10 months as nymphs and then 5 tot 12 months as an adult, depending on the species. Bigger species live longer than small species. Females generally live almost twice as long as males. When keeping insects at high temperatures, their developmental time decreases. They reach adulthood earlier, but as a consequence they will also have a shorter life span. No, they can not. 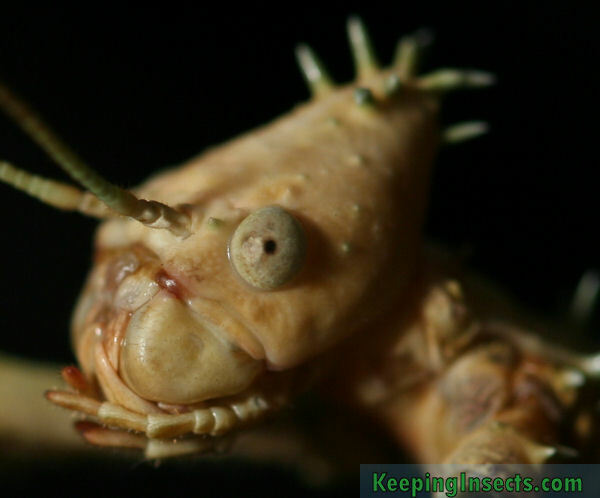 Their mouthparts are not able to chew on anything other than flat plant material. Can a stick insect harm me? Most stick insects cannot harm you, they do not have thorns or poison. But some species do have spikes on their legs designed for pinching predators. Although this pinching hurts and can draw blood, they cannot do more than this. Only very few species have this defence mechanism, namely Heteropteryx dilatata and Eurycantha calcarata. Many species have spikes, but these are used exclusively as camouflage. Some species are poisonous, you can see this because they have warning colors such as red and blue. These species are either poisonous when eaten (which you do not intent to do with pet insects, so you will not be harmed by their poison) or they can secrete a poisonous liquid. Which species do this can be read in the species description. Is it illegal to keep stick insects as pets? Some countries have strict rules about importing species from other countries. To protect the native species of insect, they ban import of foreign species. To know what the law is in your state/country, consult the website of your U.S. state or country. Can a child keep pet stick insects? Yes, children can have a lot of fun keeping stick insects. They are easy to care for and are fun to watch. Young children need to be supervised by adults when taking care of their stick insects, as young children can easily forget to feed or mist their pets. Species that are poisonous or defend themselves by pinching with their legs are not suitable for children. At the species page this is indicated. How do I know my stick insect will shed its skin soon? 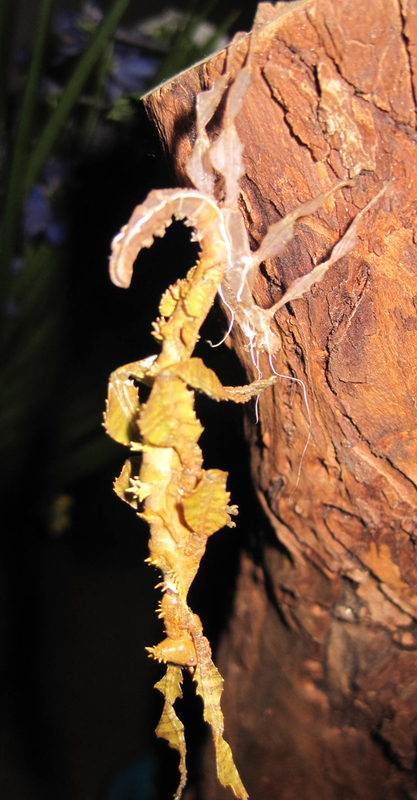 A few days prior to molting, a stick insect will refuse to eat and will hang upside down in a quiet place of the terrarium. Sometimes you can see that its skin will seem a bit white and the colors will be dull. In a species that has wings when adult, you can see the developing wings get a bit swollen before the molt. The wing bugs of a stick insect are on its back and contain the developing wings. Especially before the last molt you can see that they get quite big and thick. During the last molt the wings will come out of the wing buds and will be inflated to produce the full size wings of the stick insect. My stick insect has molted but the skin is still attached to the insect. What should I do? When the skin of the stick insect is stuck on the stick insects, there is nothing you can do. Once the skin dries, usually in half an hour, it will be stuck there. What’s worst is that the stick insect is usually in a weird shape because it has not completely left the old skin. This can be deadly. When the skin is only attached a little bit you can try to pry it loose. To prevent this from happening, you should keep your stick insects more humid. Spray their enclosure more often with water or close some of the ventilation spaces. You can also add a thicker layer of substrate like peat or soil on the bottom of the cage. This traps the water and releases it into the air slowly. How do I know my stick insect is adult? For species that have wings when adult this is simple; only adult stick insects have wings. Nymphs never have wings. For species that never grow wings, also not when adult, identifying an adult is harder. You just have to compare the appearance of your stick insect to a picture of an adult specimen, and see if it looks the same or not. What should I do if my stick insect lost its leg? First, don’t worry. There is nothing you can do. Luckily stick insects are remarkable creatures that can regenerate lost limbs! Only young stick insects are able to do so. A full sized and fully functional new limb will grow at the position of the lost leg or antenna. Every molt the new leg will get a bit bigger. After around 3 molds the leg will look the same as the other legs. If the stick insect is already adult or if it will soon reach adulthood, the limb cannot grow back because there are not enough molds left. The insect will live fine without one of its six legs. To prevent loosing legs you should spray the enclosure with water more often. This is because the most common way for a stick insect to loose its leg is for it to get stuck in the old skin while molting. The old skin dries too fast and looses its flexibility when the air humidity is too low, getting the long insect legs stuck inside. You should also make sure that the enclosure is safe, so no sticky parts, no sharp edges and no places where the leg could get stuck in.